Looking for an easy way to engage your littlest ones in the history and traditions of Judaism? If they love the monsters of Sesame Street then definitely check out the Shalom Sesame series, its a friendly way to introduce traditions and the Jewish culture. 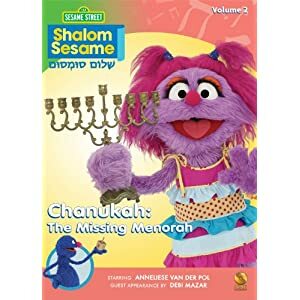 In New Shalom Sesame #2: Chanukah – The Missing Menorah , which was just released in October, the Sesame Street gang celebrates Chanukah in Israel, complete with Grover’s latkes, Menorahs and other elements of Chanukah ceremony. The new Shalom Sesame series , created by the people behind Sesame Street and starring the Muppets themselves, celebrate holidays and culture, interweaving the muppet stories with celebrities and Israelis. Viewers join families in Israel while lighting the candles or exploring other holidays as the muppets continue their storyline. Another installment in the series, New Shalom Sesame #1: Welcome to Israel , joins Grover, star Anneliese van der Pol and Christina Applegate as they explore the people and the country of Israel. « 2010 Hess Truck and Jet Now One Sale!